Mothra takes flight in this amazing sofubi vinyl figure! Based on the monster's 1964 Mothra vs. Godzilla appearance. Measures about 15-inches tall on the stand, with a wingspan of 25 inches! The Godzilla Kaiju Series Mothra 1964 Version Sofubi Vinyl Figure - Previews Exclusive is based on the monster's Mothra vs. Godzilla appearance. 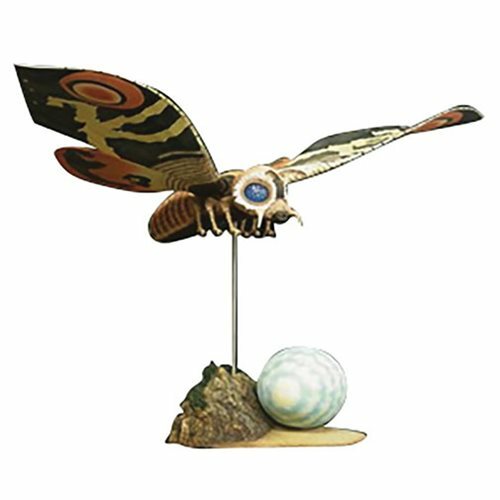 It features a base with an egg and measures slightly under 15-inches tall on the stand, with a wingspan of 25 inches! The wings are made of ABS material and will not droop in warmer temperatures, and like the Mothra '61 before it, the thorax has ABS reinforcements inside that the wings attach to for a sturdy display.